Der H: Have you seen the amount of grey stuff in the basement? Brother Handro: But won't that take up time that could be spent..
Der H: A blog I say! To the internet! With that whimsical preamble over it is time we explained what is going on. We are two old friends from Manchester who were avid hobbyists in our younger days. Teenage years came and went, University happened, and gainful employment followed, and after the boozing (Der H), studying (Brother Handro) and several years out of the hobby we both needed to scratch that plasticky-resinous-glue-induced itch that only comes from building little toy soldiers. It started out with Handro diving into the 30K era of Games Workshop's flagship Warhammer 40,000 franchise (Brother Handro: Back then we didn't have plastic/any MKII, III or IV, and all this were fields....) and starting, slowly to build up some little plastic men. Handro had wisely not thrown out all of his hobby stuff (Der H: Do I need to remind you that you threw out a Land Raider....) [Handro: It was two Land Raiders actually. And a Basilisk. And...] and hit the ground running with some great conversions. Der H came back from university into the busy life of a junior doctor and thought "You know what Handro, I've found a box of Space Hulk 2nd Ed on E-Bay. We could make time for that". As you might guess - that project is not finished. But it rekindled the love of the hobby. Here we are 5 years later and wow, the hobby has progressed, as have our lives. Scraping together to get a few squads on the table has been replaced with impulse buying plastic and resin 30K. One game system became multiple systems. One franchise became many (Brother Handro: All? ), and the butterflies finally were released. The biggest cause/excuse for this ballooning of our hobby has been buying a house! Der H recently bought a house with a basement, and his wife was nice/foolish/cunning enough to allow him free reign of the space (Brother Handro: Isn't the lock on the outside of the door?). Here it is in all its glory before being filled with the plethora of hobby bits which currently clutter the whole space. 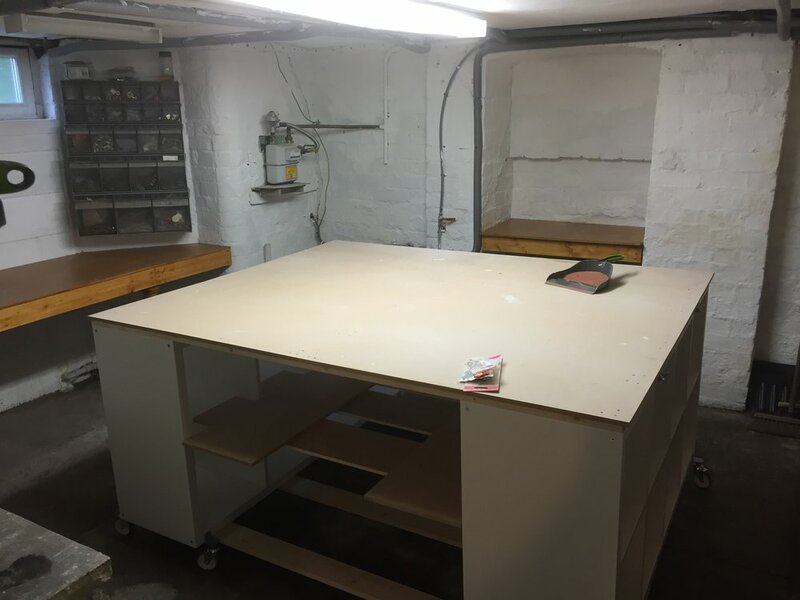 Today's image shows our 4'x6' (extendable to 4'x8') gaming/work table which takes pride of place in the hobby basement. The painting and airbrush stations occupy the other walls and off-screen there is a wall of shelves to store all the wonders that the post-2012 hobby can offer. This blog hopes to combine all of the efforts across our range of different systems and in doing so, will hopefully force our hands and make us finish some projects. Stay tuned for updates to the About us pages, project tags, reports from the Forge World Open Day, and hopefully some grey things becoming...less grey? Thought for the day: "Sanity...is for the weak!"